The Eyemobile is a specially equipped RV designed to provide FREE health screenings for vision loss, glaucoma, macular degeneration, hearing loss, diabetes retinopathy, and blood pressure. The Eyemobile is staffed by professional community health volunteers and local Lions members. 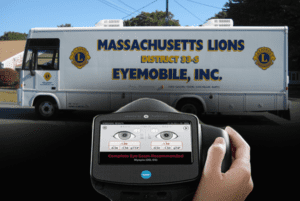 The Lions Clubs of southeastern Massachusetts in District 33-S have worked throughout the region to raise funds to support the Eyemobile. The Eyemobile travels to all communities in southeastern Massachusetts and can be scheduled for special events. Through the efforts of the Lions and donations from countless community members and local businesses, screenings are FREE. Details on scheduling the Eyemobile for your event can be found at the District 33-S website. This camera is a specialized portable handheld device designed to help Lions quickly and easily detect vision issues on patients from 6 months of age through adult. Spot Vision Screener technology is changing the way routine vision screening is done. All Lions can learn how to use the Spot camera; contact Richard Freitas or the district eyemobile committee to find out when and where training is available. Screening tests are preventive health care measures that help to identify people with increased risk for a specific condition or disease before symptoms appear or before they realize they may be at risk. Screenings are an important part of preventive health care and designed to detect health problems that otherwise would go unnoticed. If an issue is discovered, you may want to talk with your primary care doctor to determine if additional testing is necessary. Volunteers from your local Lions Club and other professional community volunteers conduct the vision, hearing and blood pressure screenings. Lions Clubs all over the world are dedicated to helping people in our communities preserve their vision and hearing. For a service-oriented group such as the Lions, conducting health screenings is a very grassroots way that we can have a direct and positive impact on our fellow citizens, especially the elderly and children. Please Note: A screening does not take the place of complete physical or eye and hearing examinations. But a screening can assist you in determining if you are in need of a professional examination and whether that need is urgent or needed very soon. Why should I be screened and what if a problem is detected? Each day that health problems go undetected or untreated, one's health may deteriorate to the point of irreversibility. The earlier these problems are detected, the more easily and successfully they can be treated. If a possible problem is detected, you will be advised to seek professional care. I've been to the doctors, why do I need another screening? It's important to see a doctor regularly. If it's been a while, a screening may identify changes in your health. Do you ever suffer from eyestrain or fatigue after using a computer? Are your arms too short to read the newspaper comfortable? Does everything seem O.K. with your vision, but you're not sure? Are you missing parts of a conversation? Do you have to turn up the volume of the TV so you can hear?